On August 9, a U.S.-supported Saudi airstrike bombed a bus carrying schoolchildren in Sa’ada, a city in northern Yemen. The New York Times reported that the students were on a recreational trip. According to the Sa’ada health department, the attack killed at least forty-three people. According to the International Committee of the Red Cross, at least twenty-nine of those killed were children under the age of fifteen, and forty-eight people were wounded, including thirty children. CNN aired horrifying, heartbreaking footage of children who survived the attack being treated in an emergency room. One of the children, carrying his UNICEF issued blue backpack, is covered with blood and badly burned. U.S. companies such as Raytheon, General Dynamics, Boeing, and Lockheed Martin have sold billions of dollars’ worth of weapons to Saudi Arabia, the United Arab Emirates and other countries in the Saudi-Emirati-led coalition which is attacking Yemen. The U.S. military refuels Saudi and Emirati warplanes through midair exercises. And, the United States helps the Saudi coalition warmakers choose their targets. Isa Blumi, an associate professor at Stockholm University and author of the book Destroying Yemen, has said the United States is “front and center responsible” for the Saudi coalition attacks. The August 9 attack against children and other civilians follows a tragic and sordid list of Saudi-Emirati attacks causing carnage and extreme affliction in Yemen. On June 12, Doctors Without Borders reported an airstrike which destroyed its newly constructed facility for treatment of cholera, in the town of Abs, built in anticipation of a third epidemic outbreak of cholera in Yemen. Scores of people were killed and wounded in an August 3 attack near the entrance to the port of Hodeidah’s Al Thawra hospital. Analysts examining the munitions used in the attack believe the killing and destruction was caused when United Arab Emirates forces situated near the Hodeidah airport fired mortars into the area. Why have the Saudis and Emiratis led a coalition attacking Yemen, the poorest country in the Arab peninsula, since March of 2015? 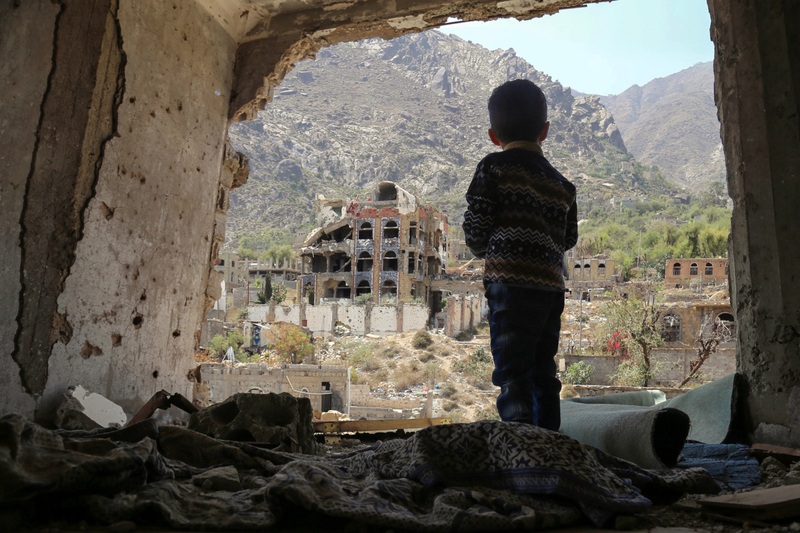 Professor Isa Blumi believes the goal is to bludgeon Yemenis into complete submission and exert control over “a gold mine” of resources, including oil reserves, natural gas, minerals, and a strategic location. Blumi notes that the war against Yemen costs the Kingdom of Saudi Arabia 200 million dollars per day, yet Saudi Arabia’s Crown Prince Mohammed bin Salman, who commented that a prolonged war is in the interests of Saudi Arabia, seems to believe the cost is worth it, considering potential future gains. Business profits seem to also motivate U.S. weapon companies that continue benefiting from weapon sales to the Saudi-Emirati led coalition. The United States is deeply implicated in the appalling carnage in Yemen. It is our responsibility as citizens to do what we can to demand an end to this complicity. Kathy Kelly (kathy@vcnv.org) co-coordinates Voices for Creative Nonviolence (www.vcnv.org).